There’s a reason James Hardie® products can be found on more than 8 million homes across North America. The company is a pioneer in the building materials industry, consistently innovating for more than a century to become the market leader in home siding and trim. And its commitment to staying on the cutting edge doesn’t stop with the products it manufactures and sells. James Hardie® continues to blaze trails in its industry on social media. 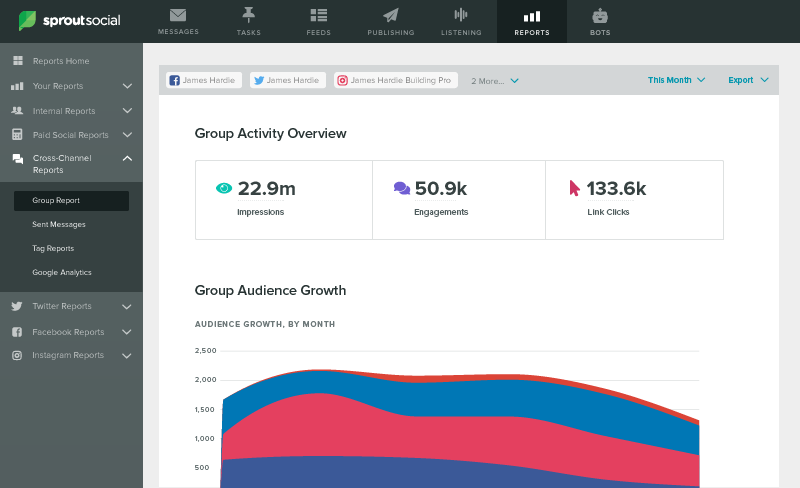 From advanced analytics to social listening and beyond, the company relies on Sprout Social to capture valuable insights and create real connection with online audiences. 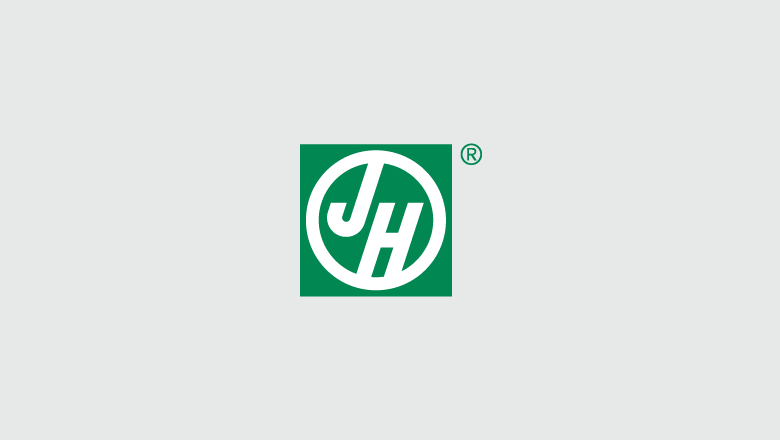 James Hardie® has long distinguished itself from competitors through more than its product line, according to Senior Digital Marketing Manager Bridget Kulla. 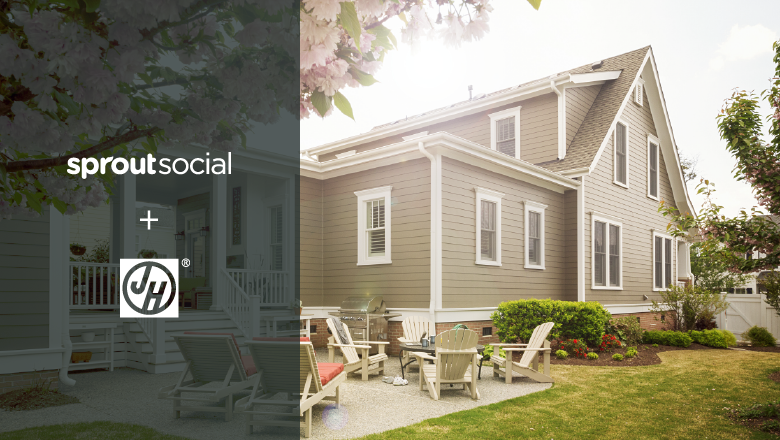 Unlike others in its industry, James Hardie® recognized the far-reaching value of crafting a strong social presence. The company used social as a primary channel for publishing thought leadership content and providing customer care, building up a community of brand fans in the process. …[W]e all get together regularly to do a deep dive into our analytics, and Sprout is really a huge component of that. It allows us to pull data in a consistent and really easy way. In fact, nearly half of consumers have used social to communicate directly with a brand, a fact known well by Associate Marketing Manager Michael Buck. As the company’s social strategy evolved, so did its focus on creating real connection with consumers. “It became more important to understand who our audience really is,” Kulla said. And just like the contractors and builders that rely on James Hardie® every day, the company needed the right tools for the job if it was going to take its social strategy to the next level. Experiences with a previous social media management software had left James Hardie® feeling frustrated. “At the end of the day it was just so clunky to use that we gave up on it,” Kulla said. While researching replacements, the company discovered Sprout Social. “Not only would Sprout help us with community management, it made it easier to schedule posts and get all the analytics we were looking for from a single location,” Kulla said. Sprout’s advanced analytics quickly became a favorite feature. This data directly informs strategy, enabling the team to better utilize Sprout’s scheduling and publishing tools. As James Hardie® learned, Sprout’s data gathering capabilities go well beyond performance reporting. We can find trends and common themes that come up in conversations. We can identify not only our own brand advocates, but brand advocates for our competition. It’s been good from so many perspectives. Through social listening, James Hardie® is able to engage in audience and trend analysis, research sentiment regarding its products, identify industry influencers and conduct competitor comparisons. Even better, the company can take the insights it uncovers and use them to optimize its business operations outside of digital marketing. Using social to collaborate with teams outside of marketing has long been a priority for James Hardie®. The company required a way to empower its sales team with social content, as well as provide a way for the sales team itself to supply the marketing department with local story ideas. Sprout created efficiencies that save us a lot of time. People talking to us are going to get a much faster response than they would have otherwise. Enter Bambu by Sprout Social, which gives employees a simple way to amplify their brand’s reach by sharing curated content across their personal social profiles. Not only does Bambu enable sales teams to increase quality leads and conversions through streamlined social publishing, it allows companies to crowdsource content from employees. “Bambu has really helped us become more relevant, more targeted and have that line of communication with the sales team that we didn’t really have before,” Kulla said. James Hardie® knows social ROI comes in all shapes and sizes. However, one of the most important metrics for the company is website traffic driven by social activity, which is often dependent on views, engagement and link clicks. The workflow efficiencies and customer care opportunities also represent major successes. …Sprout has really helped us get to the next level as it relates to creating a truly engaged network, rather than just a one-way brand microphone. Soon after adopting the Sprout Social platform, the company viewed it as an important part of its evolution. James Hardie® has been leading the way in its industry for more than 100 years, and with the help of Sprout Social, it looks to continue the trend well into the next century.